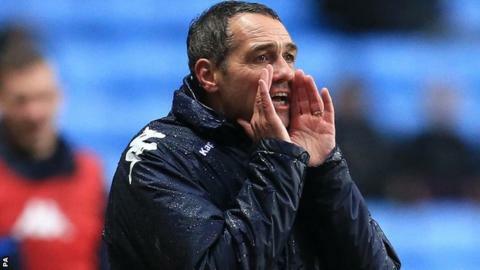 Portsmouth caretaker manager Guy Whittingham admits a record 10th defeat in a row would hurt him and his staff. Pompey have never lost 10 successive games or gone 20 games without a win and both statistics could be achieved away to Hartlepool on Tuesday. The administration-hit side could also go bottom of League One and Whittingham says he is desperate to avoid that. "Of course it will hurt," Whittingham told BBC Solent. "Every defeat hurts, we are desperately trying to avoid it." They have not won since beating Shrewsbury on 20 October 2012 while their last game without defeat was the 0-0 draw with Preston on 15 December. They are one point above bottom-placed Hartlepool and Pompey also have a 10-point penalty to come from the Football League, meaning they are face successive relegations. Whittingham knows circumstances have conspired against his side but he insists he is determined to turn things around and give the club's beleaguered supporters a lift. "We are desperate to avoid defeat - we've been trying to end this run for a long time and we know we will do it eventually. "It'll be a huge relief and a lift for everybody. This is tough for everybody and it is something that we haven't brought on ourselves. It's where we are," he continued. "It would be great to give the fans a lift and something to be cheerful about. This is none of their doing. They come and are faithful, they have been fantastic and it is because of them we keep going. "What you have to remember is what we are working against. Nobody here is responsible for this situation we are in. The people that are responsible aren't here and it is the fans that are suffering and the great staff. "We know these are tough times and we are doing what we can."